This week, Oregon will become the first state offering breweries refillable beer bottles. The not-for-profit cooperative that oversees Oregon’s bottle bill will run the project, collecting and redistributing bottles for refilling. If the program succeeds, it could become a model for the nation. Although this is very old news in other parts of the world, Oregon is about to embark on what counts as a revolutionary project in the United States. Beginning June 21st, the Oregon Beverage Recycling Cooperative will introduce refillable bottles statewide. That's when the first of the new bottles roll off the filler at Widmer Brothers. Within the following weeks, six more breweries will begin selling beer in refillable bottles. Refillable bottles are the norm in many countries; beer drinkers visiting Belgium and Germany may remember seeing refillables for sale by the crate. In fact, refillable bottles were once the norm in the United States as well. After WWII, when the United States went into industrialization hyperdrive, everything became disposable--including bottles and cans. Midcentury Americans couldn't be bothered to return bottles; they had places to go and litter to distribute. It got so bad that by the early 1970s there were massive campaigns to end littering--along with the first of the bills that put a deposit on cans and bottles to ensure their safe return. Oregon led the charge on this initiative back in 1971, and the problem of littering--at least so far as cans and bottles went--was solved. This project emerged when the Oregon Beverage Recycling Cooperative (OBRC), which oversees implementation of the Bottle Bill in Oregon, started considering a project to go back to the old refillable bottle days. While returnable bottles are a step up from the old litter days, there's still a substantial environmental cost to single-use containers. If the state could move toward refillable bottles, it would make a noticeable dent in Oregon's carbon footprint. The project started at OBRC under John Andersen, but was taken over by Jules Bailey, the former Oregon legislator (and sponsor of the Honest Pint Act), former county commissioner, and former mayoral candidate. This may seem like an odd place for Bailey to land, but projects like this give the cerebral pol the chance to actually enact public policy without the downsides of electoral politics. It scratches a number of his long-established itches--working on environmental projects and solving difficult organizational problems. When he came onboard, Bailey traveled to Germany to see how well such a system worked there. What he found was a culture built around returning bottles. In Germany, people buy beer by the crate. This makes returns easy; empty bottles go back into the crate and the crate goes back to the store. They're such a common feature of German life that Mercedes designed car trunks with dimensions to accommodate them. Bigger breweries have bottle-washing machines for the refillable bottles, and the grocery stores efficiently keep the cycle going. Of course, these German advantages pose mirror-image disadvantages for Oregon. We don't have a culture built around refillables (yet), and we don't buy beer by the crate. In terms of infrastructure, however, we are closer than any other state. Oregon is uniquely positioned to adopt a refillable bottle system. I spoke with Joel Schoening at OBRC, and he described the advantages. To begin with, the state system evolved so that OBRC, a not-for-profit cooperative, would implement statewide collection. This is a big deal. "No other state has a standing statewide collection infrastructure," he said. This means any bottle sold in the state eventually makes it back to the same place. "We've got the infrastructure, we've got the relationship with distributors," he said, "so all we needed to do was figure out how to clean the bottles." In Europe, refillable bottles come in many different shapes and sizes, but that's because the breweries wash and monitor their own. In Oregon, the OBRC will oversee the whole thing, so they needed to come up with a single bottle all breweries can use. From the brewery side, the process will look much like it does for regular bottles, which they already have to order and buy. Because OBRC will collect and distribute washed bottles, it made more sense to have a single shape. 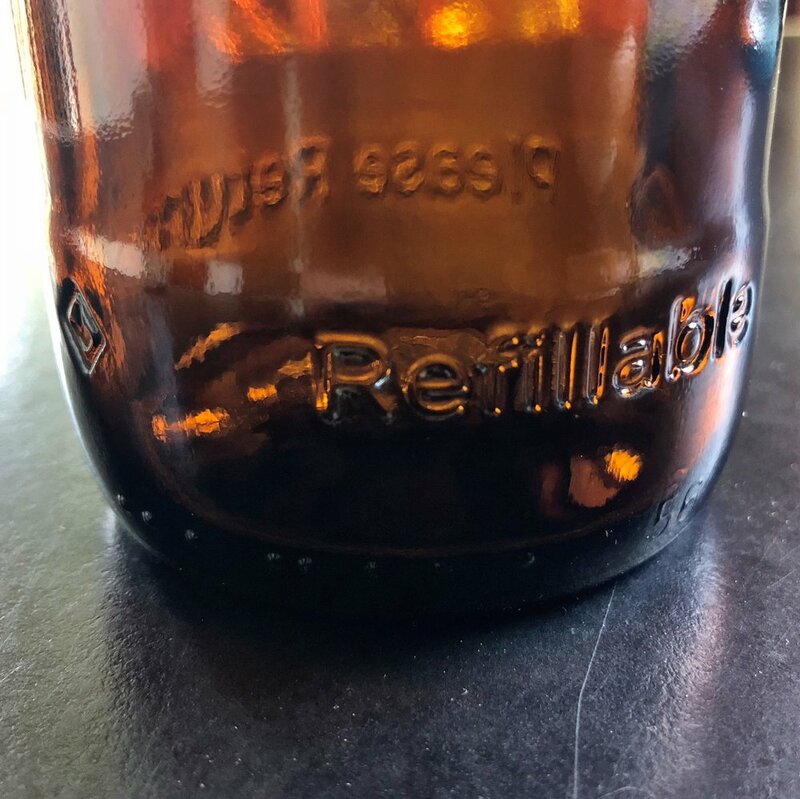 OBRC turned to Owens-Illinois, a glass manufacturer in Northeast Portland where many of our bottles already come, to develop their new refillable bottle. This is one of those seemingly easy tasks that turns out to be trickier than you'd imagine. The bottle needed to look like a beer bottle, but be easily distinguishable to sorters from current ones in use. It needed to have a protective design, with thickened areas that will touch other bottles. For the project to be financially successful, they need the bottles to go through five "turns" (refillings). That's the average across all bottles, though; in order to hit that mark, the bottles needed to be robust enough to survive many more turns. The bottles they ended up with are rated for 25 turns, and they expect the average number of uses to exceed that--though they were a bit cagey about what their secret hopes were. The first bottles out of the gate are 500 ml (16.9 oz), but 12-oz versions will soon be available. They made sure that the design would work easily on breweries' existing bottle lines, andthat mobile bottlers would be willing to participate in the project. Green Bottling seems poised to join the project, though they couldn't confirm when I spoke to Bailey. Finally, breweries will have to use new labels. Homebrewers already know that current beer labels seem to be affixed by superglue; they're nearly impossible to remove. For this project to work, labels have to be ordered through one of three label companies and be designed to come off in hot water. OBRC worked hard to make sure that the labels could be reproduced in the same colors and sizes breweries currently use. From an environmental standpoint, the new bottles should be a big improvement. They will use glass from standard-bottle returns, which will make up 70% of the new bottles. Until they see how many turns the bottles get, it will be impossible to assess the environmental impact, but they're hoping for a big improvement. Bailey was very pleased to say that everything involved in the project was local, which reduces the footprint in terms of shipping. "All the glass comes from Oregon," he said. "Everything is closed loop here in Oregon." Each bottle has a mark that identifies when it was created, and OBRC can monitor how long each one has been in the system. So far, the breweries signed up to participate are Widmer Brothers, Buoy, Gigantic, Double Mountain, GoodLife, Wild Ride, and Rock Bottom, though Bailey reports another dozen are considering it. The official launch is Thursday (June 21) from 4-7pm at the Widmer Brothers Pub if you'd like to stop in and check it out for yourself. Update. I should have been more explicit about one point. Nothing will change from the consumer perspective. Oregon has a ten cent bottle deposit, and that will apply to both single-use and refillable bottles. When the refillables are returned, the customer gets her dime back. There’s no special place to take them or special way to handle them. They just get folded into the same system Oregon has had for 47 years. Making it easy for the consumer is critical to the program’s success, and this is why Oregon’s already-easy system was ideal logistically to incorporate refillables. Though this hasn't even quite launched here in Oregon, Bailey has already been reaching out to leaders in other states to consider it. Despite the additional challenges other states have, if Oregon can pull this off, Bailey believes Oregon won't be alone. Breweries like Allagash and Brooklyn have expressed interest, which is an important precursor to adoption. Bailey has also been speaking with people in California, where they've expressed interest. The reason OBRC is already looking beyond Oregon's borders is because Oregon breweries participating in the project will have to send two types of bottles through their lines--the refillable bottles for Oregon, and other bottles for states beyond. "Our biggest problem," he acknowledged, "is out-of-state distribution." These kinds of projects succeed when they work fairly seamlessly. Oregon will be a model for other states only so long as this project meets its projections. For that reason, if you're interested in supporting the program, buy beer from breweries offering the bottle and make sure you return the bottles afterward. This could either be the start of a much larger trend, or a blind alley. I am excited to see it unfold, and am hoping we're on the leading edge of a new way of buying and managing bottled beer.